After an untrained hero's mistake cost innocent lives, the U.S. government required that all super-powered beings register their names and abilities. While many heroes felt that the move was the right one, Captain America thought the loss of liberty was too great, and went underground. This is a strange figure. It's called "Civil War Captain America," but it doesn't seem to have anything to do with the crossover. He's wearing his '90s-standard Avengers leather jacket, but comes with extra arms to create a "plain" cap for those who don't already have one. You have your choice of a mask or blonde hair to cover his head, and naturally he comes with his shield. 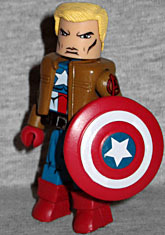 The weird thing is that he also comes with a helmet/mask combo piece that clearly belongs to the WWII version of Ultimate Captain America. 616 Cap never wore anything like it, and Ultimate Cap never wore the Avengers jacket - nor was there an Ultimate Civil War. It's nice that this toy gives us so many different varieties, but the name makes no sense. Arnim Zola was a brilliant scientist in the field of artificial intelligence and brain cloning, but he chose to use his knowledge to create super-soldiers for Captain America to fight, as well as a robotic body for himself. Now, with his personality backed up on hard drives, Zola is virtually immortal. 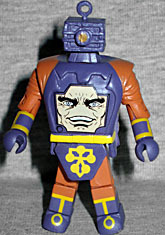 Arnim Zola is a character who lends himself very nicely to the Minimate style - his face is already a flat image projected on a screen, so nothing about it needs to be cheated when it's printed on the flat surface of the toy. He gets a waist extender for extra height, and puffy sleeves. His chest cap is new, and he gets a new head that's really just a robotic little block - but then, what else should it be? Really hoping they rerelease Zola with the Red Skull face. I know he wasn't in that body for very long but it would be a great variant.